Oh, how far she’s come in a year. 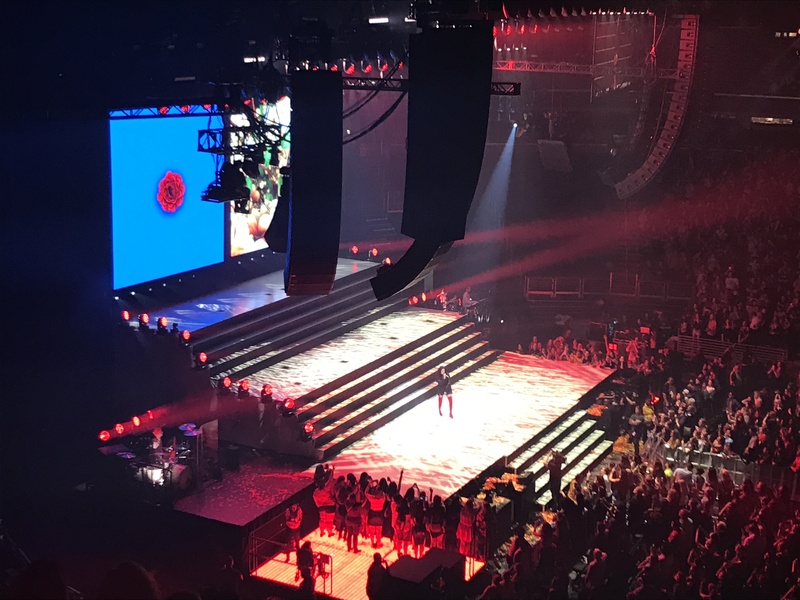 Halsey’s Hopeless Fountain Kingdom tour, in support of her recent album of the same name, outdoes her last one in spectacular fashion with its expansive stage design and graphics, and her extensive choreography and strong vocals. 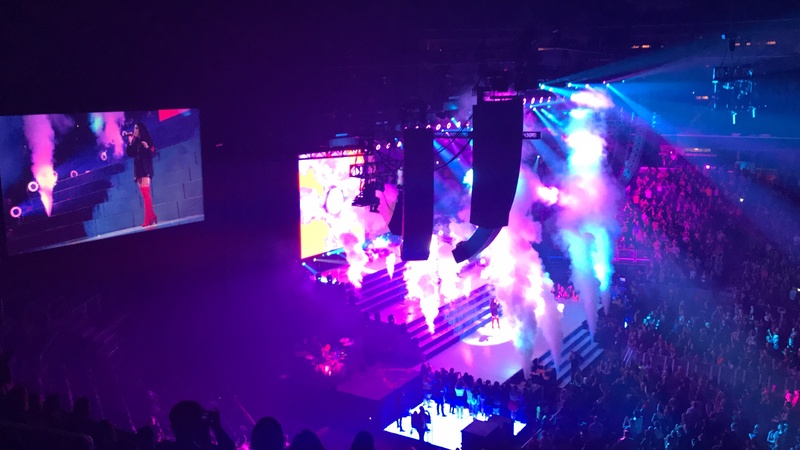 The production value of her set design was incredible, with an imposing three tiered set-up, two large screens behind, changing graphics on the fronts of the steps, various lighting schemes that matched the mood of every song, and pyrotechnic and fog machines built in. 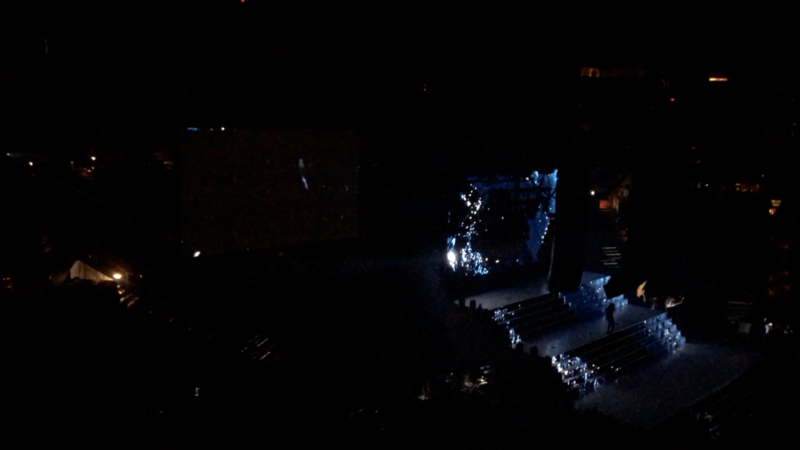 The resulting effect highlighted truly engrossing graphics and visuals that flowed seamlessly through the screens and steps, and special effects that matched and heightened the most energetic parts of the concert. From fish swimming down the steps, to bolts of lightning and blooming flowers, the visuals were truly gorgeous. Even when the graphics were more simple, the powerful colors and size of the visuals made them striking. Something worth noting is that our seats were upgraded a full section since they decided to close off the top part of the arena (presumably because she didn’t sell enough tickets). While obviously it would’ve been nice for her to have a full house, it is still an impressive feat to even be able to play an arena tour and we were certainly glad to get better seats. Plus her set was certainly worthy of an arena-sized space. Halsey’s multiple outfit changes also reflected her love of fashion and pushing its limits, with outfits including high-waisted sheer biking shorts over a thong, a tropical print bodysuit with thigh high boots, and even a Gucci-esque bedazzled face mask. Halsey is openly bisexual and put out a duet on Hopeless Fountain Kingdom with 5th Harmony’s Lauren Jauregui, who is also bisexual. Before performing the song she dedicated it to her LGBT fans, and during the song one of the screens said “Send Love” (she showed the same message at last year’s concert as well) while the other showed various couples kissing. After performing the song, Halsey noted that she saw some people walk out during the song. Her response was: “You bought a ticket to see a queer girl who loves her queer fans very f***ing much!” and the crowd went wild. It was an empowering and heartwarming affirmation of her commitment to her LGBTQ+ fans. She did mention the Romeo and Juliet concept aspect of the Hopeless Fountain Kingdom album when she noted that she had split the room into two sides, representing the two houses of Angelus and Aureum, and had each compete to cheer the loudest. It felt a little forced and even though she didn’t revisit the concept, I was glad she didn’t make it all about the two houses. The fans who had purchased VIP packages named after these houses were indeed right next to the stage on each side, making for a very up close experience. One of my favorite parts of the show was when she played a few songs on a small, circular B-stage on the other side of the arena. She performed “Lie,” which included some intense fake-fighting choreography with her dancer while splashing water on the stage, and then the very dramatic “Don’t Play.” With Halsey’s fully unleashed swagger and her “Women don’t play no games” call-and-response with the crowd, “Play” was definitely one of the highlights of the night. Despite skipping the crowd favorite “New Americana,” off of her Badlands album, she did decide to play “Closer,” now her most famous song with the Chainsmokers. She switched up the arrangement by making it a piano ballad – a nice change considering how many times we’ve all heard the regular version. The stripped-down version showed off her vocals, ending with a nice piano solo. Toward the end of the concert she said the next song was supposed to be her last but then remarked, “who really cares about a technicality?” Noting that she had neglected playing some of her older songs, she went on to play “Young God” and “Gasoline,” two deeper cuts from Badlands. This kind of defiant attitude is what her fans love (even if it’s planned). After the break and first encore song of “Gasoline,” she ended the night with “Hurricane.” She prefaced it by saying “This song is a reminder that you do not belong to anyone else” and she certainly showed that she was a force of nature with her powerful vocals and show-stopping graphics and special effects. It was an exhilarating finish to a set that proved Halsey really knows how to put on a show (with the vocals to match). Unfortunately we missed Charlie XCX because she performed before we arrived, but we did catch PARTYNEXTDOOR’s set. To say the bass was loud was an understatement; I could almost feel it in my throat. I wasn’t familiar with his songs so they did tend to blend together, but his voice sounded great when you could hear it over the bass. His songs are pretty mid tempo so they weren’t the greatest “pump up” songs but I enjoyed his set and he seemed to be enjoying it, as well. All photographs are author’s own.